Had only a couple of hours sleep before I was awakened by my ringing mobile phone. One of our customers is in our (Sydney) office today and wanted to see if I'm around. It's actually good that he called - if not, I'll be sleeping till noon. Hopped down to One on One for a quick breakfast, then out of the hotel by 7:30am. Again, long queues at KL Sentral for tickets to Masjid Jamek. With my infinite patience, I managed to get to Merdeka Square around 8:30am. Lots and lots of people milling about. The streets are still closed, and everywhere you'll find Perdana Executives and other flashy cars parked. The Merdeka parade has already started without me. Masses of people in colorful costumes passed by, then floats of different themes, sizes, and shapes. After that came the military troops, the trucks with onboard missiles, and fighter jets thundered across the sky. Due to my average height, I didn't get to see much of the parade. There were some earlier attempts to get the people in front to sit down so that people at the back can appreciate the parade, but there wasn't enough momentum, so everybody remained standing. By 11am, the sun is at its maximum heat setting, so I decided to head back for the hotel. Paid RM50 for 24 hours of Internet access so I can send off some emails and complete my eValuation. Finished by 3pm, then went to KLCC to cool off. Bought tickets for tonight's The MPO Meets Wayang Kulit. Killed time by window shopping. There's quite a few tempting sales from Isetan, Hush Puppies, and G2000. Ended up buying a pair of Primavera shoes. Much to my surprise, my special friend called up and was asking for a favor. Well, aside from that High School Musical 2 DVD, she wants me to meet up with this guy based in KL, who's the long-time penpal of her friend. Sure, no problem. I'm just a stranger in a strange land - what's the worst thing that can happen to me? I passed by Galeri Petronas and spent about an hour checking out the current exhibitions: Building Merdeka (an architecture retrospective from 1957-1966) and 50 Ways to Live in Malaysia (a series of paintings and works by 50 local artists depicting Malaysian life). The gallery is also showing videos of the more memorable Petronas TV ads for the past few years. Don't understand a word they're saying, but some of them are quite funny and interesting. 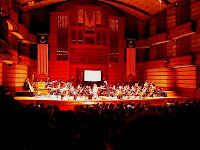 By 8:15pm, I proceeded to Dewan Filharmonik Petronas for tonight's performance. Called "The MPO Meets Wayang Kulit", it's supposed to be a fusion of East and West, Kelantanese shadow puppetry meets the orchestra. The Malaysian Philharmonic Orchestra commissioned Adeline Wong to compose “Empunya yang beroleh Sita Dewi”. The piece revolves around the famous "Ramayana" episode, where Sita is abducted by the demon-king Ravana. Most of the piece has dalang Saupi bin Isa narrating the story, and the orchestra provides the soundtrack. I have to say I wasn't too impressed with the shadowplay. It's basically Rama and Ravana fighting each other - portrayed by two puppets chasing and bouncing off each other. After the intermission, we had some real classical pieces: Georges Bizet's Jeux d'enfants and Ottorino Respighi's La Botique Fantasque, with the Overture to Rossini's The Thieving Magpie for encore. Update on the Iu-PS problem: the local engineers did a CRP hard disk swap last night. Upon my request, they did a TU reset. Didn't fix the Iu-PS problem. I went to the office early, and tried out the dummy-RNC solution. No good. I'm really hesitant to do a bbsig debug trace - it'll take me days just to sort out through the logs. Out of desperation, I asked the RNC guy to recreate all his configuration. He said he already tried that yesterday, but just the same he did it again. This time SSN 142 came up, and we were able to make a PS call. Somebody else would've given him a good sermon. I'm just so relieved it works, I even gave him a pat on the back. Found out that there's going to be a lunar eclipse tonight around 7:30pm till 8pm. Unfortunately for KL, it was drizzling, and the whole sky is covered with thick clouds. Went to MidValley Megamall for some much-needed R&R. Worst part of my job is having to do something that you have no idea about. Officially, I'm here in KL to do some MVI work - making sure our 3G SGSN works with a competitor's RNC. My colleague, whom I replaced, assured me that most of the work has been done, and all I need to do is babysit the systems and provide logs if necessary. Easy peasy - that I can do while enjoying my time in KL. First day I walked into the customer site, the project manager informed me that the PS is not working. Two out of four ATM links are up, CS is working, but not PS, and I need to fix it quick. What?! This is not my idea of a junket. First thing to do is to bring up the other two links. Bounced the links - no. Recreated the entries - no. Modified a wrong configuration - no. Turns out the RNC guy didn't create the link entries on his end. All links up - yes. PS working - no. RANAP just won't come up. It was a pretty stressful situation, I tell you, with everyone standing around watching you struggle to make things work. I decide to use my "Call-A-Friend" lifeline. After extensive consultation with my colleagues, we still don't know what's the problem. One option is to restart the TU and SMM cards. If in doubt, reboot. Another option is to do an SMM debug trace. This is going to be hairy as this is a production system - it'll produce humongous amounts of logs and might even bring down the whole box. I decide to leave it till tomorrow. Later tonight, I got an advice from another colleague to create a dummy RNC, apply-save, then delete the dummy RNC config. Said it worked for him before. That'll allow me to sleep a little bit better tonight. Yup, I'm back to Malaysia for some MVI project work, and you know what that means - 3-in-a-row in-flight movies. First movie I watched is Shrek the Third. Nothing special in here - same cast, same voice actors with the addition of Arthur, Merlin, and a few fairy-tale villains. The story continues from Shrek 2. With King Harold of Far, Far Away on his deathbed, Shrek is next in line for the throne. Feeling out of place, Shrek sets out with his pals Donkey and Puss in Boots to look for Arthur, who is the next heir. In the meantime, Prince Charming rounds up the villains at the pub and they mount an attack on the castle and managed to take the whole kingdom. Shrek and company arrive at the city and defeat Prince Charming. Arthur decides to take on the management of the kingdom. Shrek and Fiona go back to the swamp and have lots of ogre babies, and they live happily ever after. I was up for a foreign movie next, and I chose a Japanese film called Gegege no Kitaro. Had I known it was based on a manga series I would've skipped it. Live-action adaptation of manga characters rarely work, and this proved to be the case. The movie is about a bunch of yokai ghosts, who are sympathetic to humans, headed by Kitaro. Being a Japanese film, even the ghost spirits are outrageous and over-to-top. Kitaro is portrayed by this cool dude with silver hair. When fighting, his hair turns spiny and shoots out like arrows. Kitaro's Dad is this single naked eyeball with two legs. (Go figure.) We also have Neko Musume (translated as Cat Girl), who has a crush on Kitaro. She looks normal enough, but turns into a cat-like monster when angry. There are a few other characters, like the walking-wall Nurikabe, the flying-cloth Ittan Momen, the sand-throwing hag Sunakake Babaa, the old-man Konaki Jijii, etc. I would've mentioned a little about the plot here, but it's so forgettable I can't remember any of it. Next is legal thriller Fracture starring Anthony Hopkins and Ryan Gosling as the main characters. Hopkins plays Ted Crawford, a calculating aeronautical structural engineer, who shoots his cheating wife point-blank in cold blood. Gosling plays Willy Beachum, a hotshot public prosecutor who takes on the supposedly open-and-shut case. Crawford has his perfect crime all planned out and manages to have the case dismissed due to lack of evidence. Beachum and his team managed to find a gun inside the house, but all the bullets are in the chamber and the gun has never been fired. After some thinking, Beachum figures out that Crawford must have switched guns with the negotiator when the police first came into the house. That's the reason they never found the weapon. What the cops should've done is trace the clean gun and check who the owner was. It's also strange that the negotiator never bothered to check his gun all this time. Anyway, after the trial, Crawford authorized the doctors to take away his wife's breathing tubes, effectively killing her and completing his unfinished business. Beachum figured out that Crawford did a switch. With the incriminating bullet from the victim's head, Beachum starts another case against Crawford. Crawford was hoping that double jeopardy will save him, but as Beachum pointed out, the first case was for attempted murder. This time, it's for murder. No such thing as a perfect crime. Back at the hotel, I spent the night watching the Turkish Grand Prix. Massa's Ferrari started from pole position and led the race all the way till the end. Teammate Raikkonen jumped McLaren's Hamilton off the grid to take second place. Due to a late tire puncture, Hamilton had to settle for 5th place. The official results are out. The complete list of finishers and their times are printed in today's issue of SMH. I was too lazy to scan the list for my name, so I waited till the City2Surf website switched on their online search facility (by name or bib number). 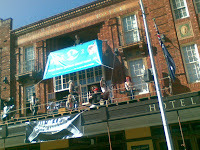 It tells me: "Well done Albert on completing The 2007 Sun-Herald City2Surf. You were 20293rd over the line with a time of 100:42." Not as good as last year's result. The upside is that I didn't feel any pain during the race, and I can still actually walk after the race. Incidentally, the website actually has a picture of me crossing the finish line up for sale. (Yes, that's me checking the time on my mobile.) Makes me wonder how they did it? Did they use some pattern-recognition software to identify the chest bibs or did they simply hire lots of people to pour through the thousands of pictures looking for matches? 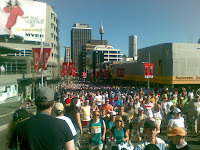 My 4th City2Surf in a row. As usual, I'm with the (Soul) Back of the Pack. I wonder when I can quality for the SH2 group, for people who finished between 75 and 99 minutes last year. This year, the race started an hour earlier at 9am. The Back of the Pack started running around 9:30am. It was a glorious day - the sun was out, but not too hot. My only complaint is that the walkers and slow runners are all over the place. I mean, people should stay on the left lanes unless they are overtaking - just like on the escalators and expressways. Maybe it's because I started a little in front of the pack, but I noticed less people who dressed up this year. You still have the fairies, the guys in full body-color, guys wearing only buggie smugglers, etc. This year we also have the ANZ ATM, runners from the Sydney Children's Hospital hoisting a kid strapped on a stretcher, and Borat in his trademark neon green thong also made an appearance. I finished with a time of 2:01:10. That still has to be adjusted for the late start. By my own reckoning, I finished the race in 90 minutes, but we'll see what the official time is when the results are announced/published on Tuesday. After the race, it's off to Swiss Grand Hotel for lunch buffet with the P&G guys. A lot of the people are already there, and I believe my sister dropped in an hour later. Then, it's a kilometer-long queue for the buses to the city. I personally don't mind standing in the cold in my T-shirt and shorts, but it really bothers me that some people still have the gall to cut in pretend they didn't know there's a queue. The more outspoken ones in the line would admonish them, yet they suddenly go deaf in the hearing. I was telling the couple behind me that maybe we should've headed straight for the buses half an hour ago, and be done with it. In the end, it's all about doing the right thing. What better way to build camaraderie among employees of a Finnish mobile company and a German conglomerate by having a costume party and two days of team-building. In past company outings, we would take a coach to the site, then do our team-building activities there. This year, we did it Amazing-Style race with puzzles and challenges and multiple pit stops along the way. Everyone congregated at Refinery Park, and teams were formed. First challenge is to devise a four-line chant. Then we were given a character-substitution puzzle with the cipher key given. Being one of only two locals in our team, I quickly guessed Tumbalong Park as the next pit stop, even though we only partially solved the puzzle. 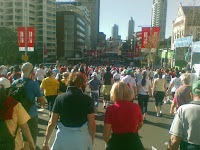 We were first to move out towards Darling Harbour, yet we got there almost last. I figured everyone else just followed in the general direction. Unfortunately, a few our my teammates announced that they don't feel comfortable running. At Tumbalong Park, we were asked to draw portraits of two team members and make a presentation of it. We got the portraits, but the presentation didn't happen as were running short of time already. We were told to head for Dixon Street in Chinatown, take some tea, and sample the weirdest food we can find. For A round of (service) tea and a takeaway box of seafood, the restaurant charged us $40. They must've thought we're the real deal. We didn't get the chance to sample the food because our coordinator was rushing us to the station to catch the 11:03 train. In our haste to get to Central, we forgot to get the next clue. So we were standing in line to buy the tickets, yet we have no idea where we're going. The guy in front of me said it's Parramatta. And I go, yeah right. Just goes to show watching Amazing Race does make you lose faith in your fellowman. Turns out we ARE going to Paramatta. For our next challenge, (while on the train) we have to go to www.thrill.com.au (the event organizer's website), and identify some Sydney landmarks. Isn't technology amazing. A few years ago, who would've imagined that using your mobile phone, you can connect to the Internet and browse any website in full color? Upon reaching Parramatta, we ran all the way to the next pit stop, St. John's Cathedral. After some drinks and fruits and muesli bars, we were given a Detour: recreate a 16x16 matrix from memory, or re-arrange 7 tangram pieces into a square. As as admission of our age, the team opted to solve the puzzle. Our next clue is in the form of another puzzle, which we deduced to be an Irish pub in Emu Plains. O'Donoghue's is the best pit stop of all because this is where we had our lunch - finger foods and drinks. No rest for the wicked, though. While waiting for the food to come out, another Detour: the team has a choice of either telling two jokes, or doing a karaoke number. I wanted to tell the joke about the similarity between women's breasts and a PS2, but the team decided to maintain its wholesome image. So I went for the vampire and the dentist. All thanks to the jokes section of GQ on Mobizines. After the light lunch, we're off to Katoomba. During the 1.5-hour journey, we were asked to fashion a train out of ice cream sticks and rubber banks and Scotch tape. Took us the whole journey to do it. Little did we know that the other teams made use of additional materials like water bottles, which saved them heaps of time and effort. From Katoomba, another puzzle led us to Echo Point where we are supposed to should out our (former) company names. Yeah, great way to build morale. For our last challenge, we have to solve another character-substitution puzzle to get to the final pitstop. I managed to solve it, but doesn't really matter because the mini-bus took us straight to Peppers Fairmont Resort in Leura. Before letting us off to our rooms, we had to go through an aboriginal performance, then everyone has to imitate animals like kangaroos, dingoes, etc. What a way to end the day. The costume party starts at 7:30pm, and the theme is Pirates of the Caribbean. Most guys don't really care because by 7pm, they're still either at the bar, at the sauna or playing pool or tennis. Instead of a swashbuckling pirate, I chose to be a music pirate (see previous post), but nobody seemed to notice. Place is too dark anyway. Only a couple of people asked, and I had to show them my shirt and how I'm supposed to be a music pirate. Cheeky, they said. I stayed around for the food, but left the moment people stood up to dance. I really can't take strobing lights and thumping beats and senseless gyrations. Went back to my room and watched British cult comedy Nighty Night and a zombie movie called Severed: Forest of the Dead on SBS. Pretty engrossing. It's about lumberjacks becoming zombies when they come in contact with sap from genetically-modified trees in the forest.